One of Sano’s expert Physiotherapists, Nick Brown, has compiled an excellent short guide for anyone suffering with whiplash injury symptoms following a car crash or road traffic collision. These details are meant as informational and are, in no way, meant to replace the bespoke instructions of a Physiotherapist. If you believe you are suffering with whiplash symptoms please contact our central admin/booking office on 0113 257 8594 to arrange a no-obligation assessment and hands-on treatment with a fully qualified, expert Sano Physiotherapist. Whiplash is caused by the head being thrown forwards, backwards or laterally (side-to-side) due to an external force, usually a car crash. These symptoms usually present within 24hrs of the car accident. People often report feeling minimal pain at the time however, wake up the next morning with some or all of these symptoms. 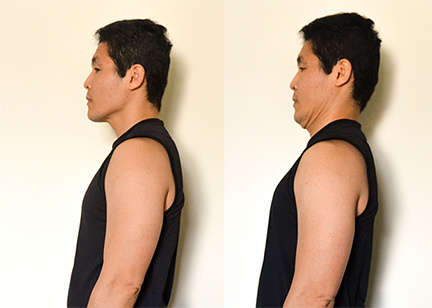 ‘Chin Tucks’ – Chin Tucks or ‘Cervical Retractions’ are when the patient attempts to move the chin directly backwards (Give yourself a double chin). ‘Look Left, Look Right’ – The name says it all. Looking over each shoulder to improve range. Once the exercises above are feeling more comfortable you can begin combining the first one with the two below it. These exercises will be uncomfortable, which is ok, but don’t make it painful for yourself!